Shows animated weather images showing current conditions and next 2 days. Tap center of hands to make them temporarily disappear courtesy Ram Mor. -TAP 9 oclock- To cycle through 4 levels of additional dark filters. Good for when display is too bright in a dark setting. 4th Tap is complete darkness Theater Mode. Digital time shows time zone set in wm settings. Scrolling weather shows current temperature, HI LO temps, location, current conditions. 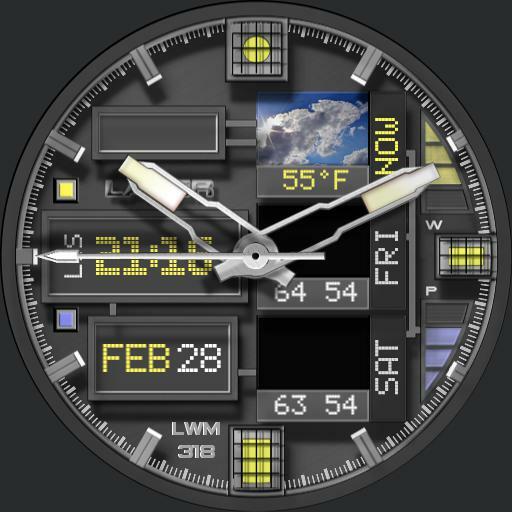 Tap current weather to update weather. Shows phone and battery levels.